Cosmonauts Dmitri Kondratyev and Oleg Skripochka returned to the Pirs airlock module and closed the hatch at 2:52 p.m. EST, wrapping up a smooth five-hour 23-minute spacewalk to install telemetry gear and a television camera on the hull of the International Space Station. The spacewalkers also retrieved a materials science experiment and an instrument that is no longer working properly. The year's first space station EVA began at 9:29 a.m. It was the 152nd spacewalk devoted to station assembly and maintenance since construction began in 1998, the 27th carried out by Russian cosmonauts and the first so far this year. It was the second spacewalk for Skripochka and the first for Kondratyev. Total space station EVA time now stands at 956 hours and 14 minutes. Four hours into a planned six-hour spacewalk, cosmonauts Dmitri Kondratyev and Oleg Skripochka are running well ahead of schedule with space station maintenance and upgrade work. They have successfully installed a new telemetry transmission system on the hull of the Zvezda command module, jettisoned an associated cable reel and protective cover and removed an instrument called a plasma pulse generator that has not been working properly. They also have retrieved a materials science space exposure experiment. The final major objective of the spacewalk is to mount a television camera on the forward Rassvet mini-research and docking module. Cosmonauts Dmitri Kondratyev and Oleg Skripochka opened the hatch of the Pirs airlock compartment at 9:29 a.m. EST (GMT-5) Friday, beginning a planned six-hour spacewalk to perform routine maintenance and upgrades on the Russian segment of the International Space Station. For identification, Kondratyev, call sign EV-1, is wearing a spacesuit with red markings while Skripochka, EV-2, is using a suit with blue stripes. 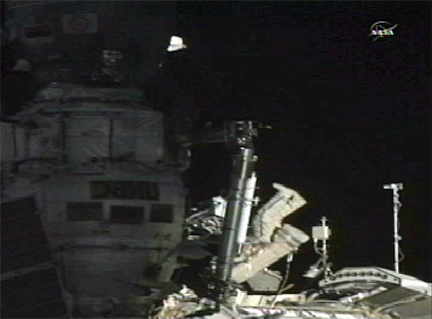 It is the first spacewalk for Kondratyev and the second for Skripochka. The primary goals of the excursion are to install an external telemetry system that will allow high-speed data to be transmitted directly to the ground; to remove a balky instrument on the Zvezda command module; to retrieve a materials science experiment; and to install a television camera on the Rassvet module. The cosmonauts will jettison a protective cover and a cable reel associated with the telemetry system. As a standard safety precaution, Expedition 26 commander Scott Kelly and Alexander Kaleri will remain inside the Russian Poisk module for the duration of the spacewalk. Astronauts Catherine Coleman and Paolo Nespoli will remain in the U.S. segment of the lab. This is the 152nd spacewalk devoted to space station assembly and maintenance since construction began in 1998, the first so far this year and the 27th carried out by Russian cosmonauts. Going into today's excursion, space station EVA time stood at 950 hours and 51 minutes.